Published by Kodansha in 1999, Katsuhiko Takahashi's 2000 Yoshikawa Eiji Literature prize-winning novel Fiery Enmity: Hero of the North (The Legend of Aterui) will be adapted to the stage. In the 8th century, while expanding its dominion to the Tohoku area, the Yamato Imperial Court seeks to conquer Ezo. Aterui, the young leader of Ezo, stands up to protect his hometown and joins forces with his allies in the hopes of defeating the imperial forces. However, triumph leads to more battles and before long, the fate of the Emishi people falls into the hands of Sakanoue no Tamuramaro, the imperial army's trump card. 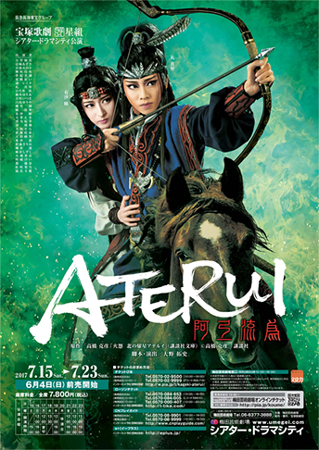 Aterui's drive to protect the pride of the Emishi people will be entangled in fierce battle within this spectacular musical work. Created by caithion. Last Modification: Monday 25 of February, 2019 06:15:06 PST by caithion.